Kaluga, Penza and Tatarstan set out their stall for investors at the Russo-British Chamber of Commerce’s annual conference. Investing into Russia and its regions was the focus of the annual Business Forum organised by the Russo-British Chamber of Commerce in London on June 6. Almost 200 delegates, including Russia’s Ambassador Alexander Yakovenko, Prince Michael of Kent and Britain’s Minister for Europe, David Lidington, gathered at BMA House in central London to discuss bilateral trade and investment prospects. According to Trevor Barton, the RBCC Executive Director, Russia is UK’s fastest growing export market with a solid growth rate of 35-40 percent per year. He says the demand for imported goods in Russia is as high as ever, in particular thanks to rapidly growing IT, telecom and construction industries, which are always hungry for the latest know-how. Wealthy Russians are traditionally fond of British luxury car and clothes brands, while the rising middle class is starting to appreciate specialist foods, well-crafted furniture and designer home accessories, Barton said. Despite the seeming abundance of opportunities, there are less than 1,000 representative offices for British firms – significantly fewer than the number of German companies registered (about 6,000). Many UK companies still don’t realise they have products that will find a market in Russia, Barton said. Most investors say that bureaucracy, corruption and poor rule of law continue to undermine confidence in Russia. But experts at the RBCC conference said that many problems can be avoided with proper preparation before entering the market. 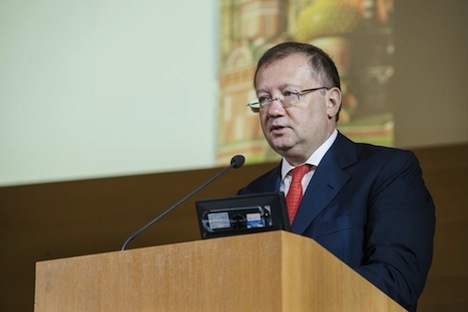 To illustrate this point, RBCC invited representatives of some of Russia’s most attractive regions for foreign investors – Kaluga, Penza and Tatarstan. Kaluga, sometimes referred to as the “Russian Singapore,” has managed to become a leading region in terms of industrial production and investment climate in the last 10 years. In the absence of natural resources deposits, it began developing manufacturing by creating industrial parks and offering tax benefits to investors. To show his interest in reforms, the region’s governor, Anatoly Artamonov, even started handing out his mobile number to local businessmen – a move quite uncommon for a Russian official. As a result, over 70 plants owned by the likes of Volkswagen, Renault and L’Oreal operate inside Kaluga’s automotive, logistics and pharmaceutical clusters. Shamil Ageyev, from Tatarstan’s Trade and Industry Chamber, emphasized to investors at the conference the republic’s commitment to innovation. The regional government’s current priority is construction of a $670 million technology hub outside Kazan, called Innopolis. It will feature an IT park, university, full-scale residential complex and a business incubator. US Carnegie Mellon University, renowned for its strength in IT, is among the project’s potential partners. Participants in the conference said that the Russian and UK governments both appeared very supportive of promoting bilateral investment and trade, with annual turnover of over $23 billion having just beaten pre-crisis levels.